After my GM for yesterday suffered from a nasty case of the “I’ve been ill! My girlfriend has been ill! There’s been a Christmas! Work!” and couldn’t run his game on Saturday I stepped in by grabbing an old Dragon Warriors scenario (A Shadow On The Mist from The Way of Wizardry) and the draft of the Fate Core rules. The rest of this entry doesn’t try to explain how Fate works, so it would be of benefit to have a read of at least one version of the system. Evil Hat are currently running a kickstarter for Fate Core. You can get a fantastic number of PDFs for $10, along with early access to drafts of most of them, but there are less than three days remaining to get in on the action. Character creation went fairly smoothly, with just two problems (which I didn’t make a fuss about because it was a one-shot organised at the eleventh hour). I was a little concerned that some of the characters’ aspects were rather too focused on the same things. I suspect there are a number of factors that contributed to this. First, being in a rush (needing to character creation and an adventure in one day) and defining a very vague world to play in (it is fantasy with a medieval feel). This didn’t give a great deal for players to latch onto with aspects and demanded a lot of creativity from them. This also meant that the players didn’t get a lot of notice about what the game was going to be, so didn’t have a lot of time to think about what sort of characters they wanted to play. There was also a lack of experience (among the PCs) with Fate and lots of experience with D&D and similar games where for many games it is enough to be a Tough Fighter. If I continued running the game, I’d let players significantly adjust their aspects for at least the first few sessions so they could flesh out their backgrounds and what they meant to the characters. For future games, I think I’ll put together (or pillage from elsewhere) a sheet of questions to spark background ideas and give them to the players at least a week in advance. The second problem—what a lot of space is devoted to problems, they really weren’t bad, I just want to think about what caused them and try to avoid them in the future—was that the example stunts were generally treated as a shopping list rather then an example of how to build your own stunts. I’m going to blame the “being in a rush” thing for this. Weapons and Armour. I decided that I didn’t want the game to revolve around the toys so I ruled that everybody would get appropriate mundane equipment for their skills, but that “nice” equipment could be bought as an extra for 1 refresh. “nice” in this context meant Weapon: 2, Armor: 2 or some appropriate bonus for any other kind of equipment plus an aspect describing it. This allowed players to have Massive Platemail or The Enchanted Sword of Ilderial. In the end, only one player took advantage of this with a distinctive suit of armour that was a prize signifying his victory in a fighting competition. Magic. I went down two routes for this. I had a Dwarven Cleric who I dropped a variation of The Subtle Art rules on. He took a skill called Invocation and used it to perform blessings. (I removed the 30 minutes in a dark room requirement, but reduced the time span down to that of an ordinary Create An Advantage). He also took a stunt which allowed him to use the skill to make melee attacks with his holy weapon. Representing the forces of the arcane, was a wizard using the Schools of Power rules from the revised Extras chapter. He created an arcane order devoted to collecting knowledge (and suffered more than the rest on trying to come up with aspects as he had 8 to deal with instead of 5). Between having fewer fate points in hand, a limit on one fate point spent to invoke aspects per roll and the rules for getting a boost when you succeed with style on defence and when you hit for no stress on attack… there were lots of aspects being created. This… I like, a lot. Whoops. It looks like I misinterpreted a rule. The book says “You can also stack multiple free invocations together.” which I somehow interpreted as “You can’t stack paid invocations together” instead of “You can’t stack paid invocations of the same aspect together”. The number of available Fate points still discourages that though. The scenario I was (more or less straight of the book) was somewhat flawed in that it didn’t give the characters any motivation to explore most of the “dungeon”. It was very much a case of “We’ve found the sword and we’re pretty sure that the tax money is days away now, let’s go home” after they’d explored about half the area. It seems I also failed to telegraph the importance of the sword (containing the secret message to a conspirator) enough as it was grabbed, not investigated, then returned to the (evil) employer (allowing his plot to assassinate the Baron to go unchallenged). I definitely need more experience at setting the challenge level of fights. I think I was getting there—the second zombie the party fought was definitely hurting them more then the first… although it was aided by the wizard who never bothered moving away from it—but ran in to the “We have what we came for” issue I mentioned earlier before getting on to the third fight. Still, despite those issues, the game seemed to be fun for everyone so I’m going to chalk it up as a success (both as a game and as a learning experience for me). It managed to prove Fate to me as a game that works in the context of a dungeon crawl (I’d never run a Fate game with a significant amount of exploration before) and for traditional fantasy. This has given me the confidence to follow through with something I’ve been plotting for the last few weeks and offer up a Planescape inspired Fate campaign for my London based Tuesday night group. The cover of The Way of Wizardry is taken from RPG Geek‘s (presumed) scan of the original cover and is used to reference a book discussed above. 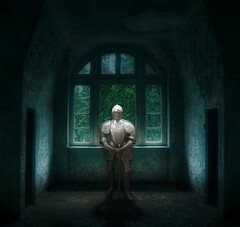 The Forgotten Knight image by pareeerica is used under a Creative Commons CC BY-NC-ND 2.0 license. This entry was posted in Dragon Warriors, FATE, RPG. Bookmark the permalink. Nice report. I own the Dragon Warriors series and might run that campaign using Fate as well, now that I have seen someone do it.